Taking its cue from the 35% campaign’s corporate complaint, Southwark News has revealed the reality behind the great affordable housing illusion. It’s latest edition devoted a whole page to ‘broken social housing promises’, citing cases of social rented homes being delivered as affordable rent and affordable homes ending up on the open market. Southwark Council has responded to the complaint saying ‘it takes it very seriously’ and confirms that it is taking legal action. However, this leaves many questions unanswered - how many breaches have occured? which developers or housing associations are breaking their promises? how many social rented homes have been lost? how is Southwark going to get them back? how will it prevent this from happening in the future? how widespread is this practice? - so this is a complaint that we will be pursuing. Southwark Council needs to give a full response and explanation for each of these alleged breaches. Unless it does so we can have no confidence that it is indeed taking the breaches seriously. We find it hard to believe that the Council did not have some idea of what was going on, given its extensive relationships with developers and housing associations. The involvement of housing associations in these alleged breaches is a particular concern. All private developments which deliver affordable housing need housing association partners and most people would assume that these are doing their upmost to guarantee the maximum affordable housing of the right kind - i.e. the tenure approved at the planning committee hearing. It appears that this is not the case. 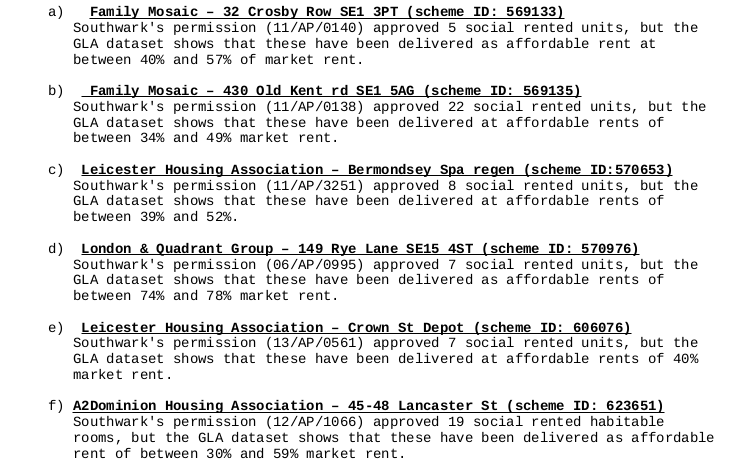 Southwark Council has an approved list of housing association partners. It should seriously consider whether any housing association in breach of a planning approval should continue as a partner. It goes without saying that these breaches are making a real difference to people who rely upon social rented housing, as the main example given in the Southwark News shows. This is in fact the Colorama development - a former photo film processing centre on Lancaster street, which was demolished in 2014 following planning permission granted for its replacement by the Chroma buildings, a residential development comprising 39 flats delivered by Housing association A2Dominion. At the time, Southwark’s planning committee justified the demolition of the period buildings by claiming that “the redevelopment would bring much-needed affordable housing”, with the planning report for the application promising the provision of 19 social rented habitable rooms. However, two years later when the Greater London Authority published its affordable housing outturn data, it showed that these were being provided as affordable rent not social rent. These range up to 59% market rent with estimated rent levels of £215pw for a 1-bed flat - more than twice the current average social rent currently charged in Southwark. The scheme has now completed and new residents have begun moving in. Needless to say, these won’t include any of those on the Council’s waiting list who can’t afford anything except social rented housing. It seems clear that together Southwark, private developers and housing associations are not delivering even the meagre amount of social rented housing that they claim. Southwark’s response confirms this, but is otherwise feeble. 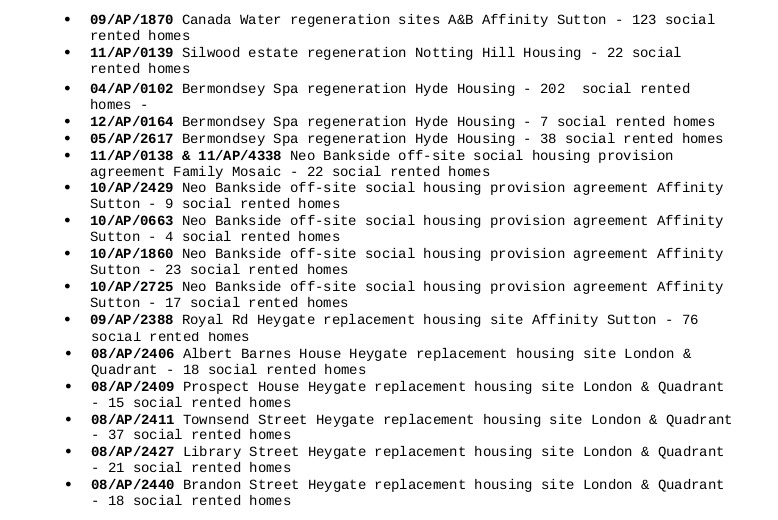 Southwark must give a full and detailed account of each alleged breach, say what action it is taking to get the social rented housing promised and what it is doing to prevent these practices from continuing.